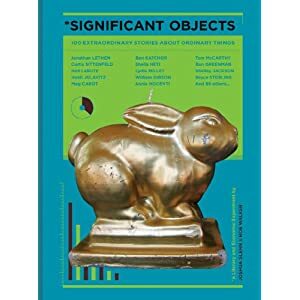 Significant Objects, Joshua Glenn, Ed. Source: Amazon.com. A few weeks ago, I mused about a zeitgeist of everyday objects as containers for sentiment. Since then, WNYC’s Studio 360 program aired a segment and a short story contest, “In Search of Significant Objects.” It was inspired by a new book, Significant Objects, due out July 2, 2012. What is this about? The authentic, mundane, intimate, analog, in reaction to increasingly digital/virtual/distant/homogenized experiences? Is it this: remix culture –> we-are-all-curators / personal brand managers –> narcissists of small differences = We are all becoming Miranda Julys?